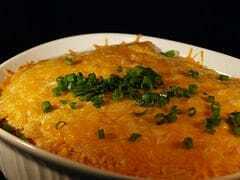 Looking for an easy to make casserole that reheats well? This tasty casserole filled with ground beef, cheese, and canned tomatoes is easy to make, and tastes great. This recipe is by Virginia McDowell. Jefferson City. Mo. 1955. This tamale casserole is a great weeknight meal, this dish reheats well. Put in a saucepan cornmeal, salt, and water. Add gradually Pet milk. Boil and stir until mixture thickens. Cover and let cool. Preheat oven to 375 degrees. Grease a shallow 9 X 13-inch baking pan. Brown meat and onion cook until almost done. Drain off excess fat, and add tomatoes, salt and pepper to taste and chili powder. Stir and cook until done. Spread 1/2 cornmeal in dish then add meat mixture. Top with remaining cornmeal. Bake until the top is light brown for about 35 minutes. There’s cheese in the picture, but not in the recipe. What gives??!! I like cheese, I will add a sprinkle of cheese is optional. Can Corn meal be altered with corn muffin mix in the tamale casserole? Can you be more specific with your question, are you wanting to use a corn bread mix instead?